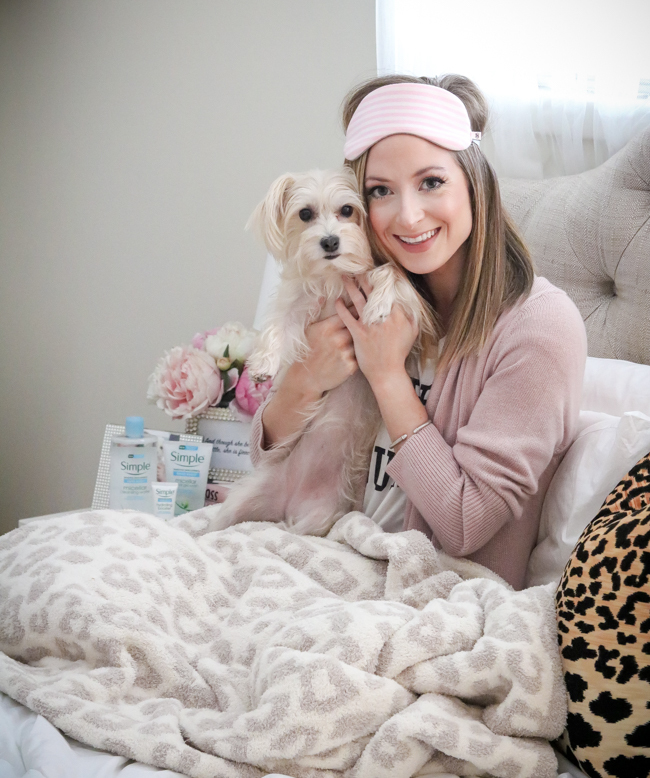 I'm super excited for today's post because I'm sharing my quick & easy night time routine and some new, amazing products from Simple's Water Boost product line. 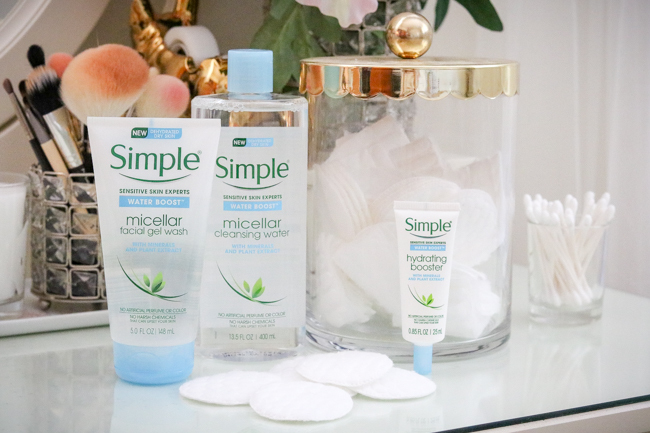 I've been using Simple's Micellar Water for years now and absolutely love how gentle it is on my sensitive skin. They recently came out with a new line that includes the Water Boost Hydrating Booster, Micellar Cleansing Water, and Micellar Gel Wash. Each product reverses the signs of dehydration which I, for one, need in my life. The California weather is so much drier than what I'm used to and I've noticed it's taken quite a toll on my skin. Most nights I don't want a long, drawn out skin care routine so Simple makes it easy! The first thing I do after a long day is to change into some comfy clothes. If I'm already in comfy clothes, I basically change into a different set or even comfier clothes haha (the work from home life). Before I ever touch the bed I like to clean my skin because I know once I lay down it's game over. Is anyone else that way?! Heidi is so funny and always beats Justin and me to bed. She normally sleeps in her crate and for some reason, time and time again, thinks if she makes it to our bed first, somehow she'll get to stay lol. 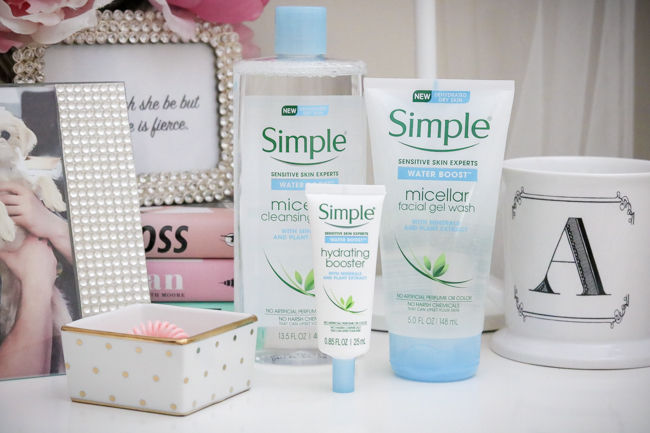 The first product I use in the Simple Water Boost Micellar Cleansing Water. I simply pour some of the product onto a cotton pad (I prefer the premium kind). I then take the pad and remove as much makeup as I can. Sometimes it takes two pads depending on the amount of product I use that day. The micellar water is infused with minerals and plant extract that help the skin to feel hydrated. These soothing ingredients cleanse both dirt and makeup - so even days I don't use cosmetics I still use the micellar water! Next, I use the Simple Water Boost Micellar Gel Wash to cleanse my skin and remove any excess makeup still present. I like to wet my face first with warm water and use a wash cloth to remove the gel. The gel wash is soap-free (with micellar bubbles) and cleanses without over-drying or leaving the skin feeling tight. And it really does! The first time I used it, my skin felt silky soft and squeaky clean. 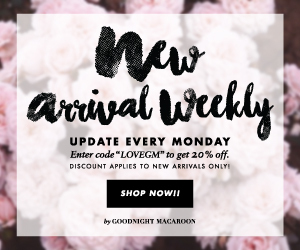 It's perfect for sensitive skin! And lastly, I use the Simple Water Boost Hydrating Booster. It's a multi-purpose product that delivers instant 24-hour long-lasting hydration and can even be used as a primer! Other uses include mixing it with your daily moisturizer (like Simple Replenishing Moisturizer) and for a spot treatment throughout the day on dry areas. After I'm done with my skin care routine I like to make a hot cup of white pomegranate tea. I've found that it really helps me get to sleep without laying awake with my mind wandering. A lot of times I drink my tea on the couch or in bed while I prepare the next day's blog post. I'd love to say I have them done well in advance but it never fails... I'm usually making edits and changes late at night before I go to bed. Justin (and Heidi) is usually asleep before me, so many times I will finish things up in the living room while watching Netflix. The only bad thing is that I usually end up binge watching and staying awake way too long. Have a fabulous Monday and I'll see you back here Wednesday!